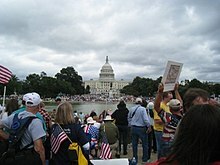 Tea Party protesters fill the West Lawn of the U.S. Capitol and the National Mall on September 12, 2009. The Tea Party is an American populist political movement. Most people say it is conservative and libertarian. has sponsored protests and supported political candidates since 2009.
wants a strict interpretation of the United States Constitution, not changing its meaning to fit modern ideas and advances. The name "Tea Party" comes from the Boston Tea Party, a protest by colonists who objected to a British tax on tea in 1773. They demonstrated by dumping British tea taken from docked ships into the harbor. Some say that the Tea in "Tea Party" also stands for "Taxed Enough Already". The Tea Party movement has caucuses (groups) in the House of Representatives and the Senate of the United States. Many of the members of the Tea Party caucus were first elected in the 2010 midterm elections. Some of them had never held any public office before. The Tea Party movement has no central leadership but is composed of a loose linking of national and local groups that decide their own platforms and agendas. The Tea Party movement has been cited as an example of grassroots political activity, although it has also been cited as an example of astroturfing. The Tea Party's most famous national figures include Republican politicians such as Sarah Palin, Ron Paul, and Michele Bachmann. As of 2010, the Tea Party movement is not a national political party, but has endorsed Republican candidates. A Gallup poll shows almost 80% of Tea Partiers say they are Republicans. Commentators, including Gallup Editor-in-Chief Frank Newport, have suggested that the movement is not a new political group but simply a rebranding of traditional Republican candidates and policies. An October 2010 Washington Post canvass of local Tea Party organizers found 87% saying "dissatisfaction with mainstream Republican Party leaders" was "an important factor in the support the group has received so far". Though many are opposed to GOP leadership, they are even more opposed to President Obama. Some members believe that President Obama was not born in the United States (despite a birth certificate showing he was born in Hawaii). One of the main positions the Tea Party took was against the debt ceiling (the amount of money the U.S. is allowed to borrow). Many voted against any raising of the debt ceiling. Others demanded large spending cuts and a balanced budget amendment to the U.S. Constitution. ↑ Servatius, David (March 6, 2009). "Anti-tax-and-spend group throws "tea party" at Capitol". Deseret News. Retrieved June 16, 2009. ↑ "Anger Management" (Paid subscription required). The Economist. March 5, 2009. Retrieved April 25, 2010. ↑ Tapscott, Mark (March 19, 2009). "Tea parties are flash crowds Obama should fear". The San Francisco Examiner. Retrieved June 16, 2009. ↑ Lepore, Jill (2010). The Whites of Their Eyes: The Tea Party's Revolution and the Battle over American History. Princeton University Press. pp. 77–79. ISBN 978-0691150277. ↑ Politico, April 08 2009 "T.E.A. = Taxed Enough Already"
↑ Senate Tea Party Caucus to Meet Jan. 27 Roll Call, Jan. 14, 2011. Retrieved 2011-01-29. ↑ Rasmussen, Scott W.; Schoen, Doug. Mad As Hell: How the Tea Party Movement Is Fundamentally Remaking Our Two-Party System. Harper. pp. 132–136. ISBN 978-0-06-199523-1. ↑ Rasmussen, Scott; Schoen, Doug (2010). Mad As Hell: How the Tea Party Movement Is Fundamentally Remaking Our Two-Party System. HarperCollins. p. 12. ISBN 9780061995231. ↑ 18.0 18.1 "Tea Party Supporters Overlap Republican Base". Gallup Poll. July 2, 2010. Retrieved November 24, 2010. ↑ "Tea Party = Republican party?". Washington Post. July 6, 2010. Retrieved November 24, 2010. ↑ Tea Party canvass results, Category: "What They Believe" A Party Face Washington Post October 24, 2010. Retrieved 2011-01-28. ↑ Ingold, John (April 15, 2009). "5,000 attend tax-day 'tea party' at Capitol". The Denver Post. Retrieved July 23, 2009. ↑ Bernstein, David S. (July 22, 2009). "Birthers In The Mainstream". The Boston Phoenix.